Corporate Features｜Corporate Information｜Maruichi Steel Tube Ltd.
Maruichi Steel Tube has unique features based on its know-how and experience cultivated through a business expansion focusing on steel tubes. This page introduces the special features of our company. Maruichi Steel Tube deploys including those operated by the associated companies from Hokkaido to Kyushu. These plants greatly contribute to distribution cost reduction as well as improvement in service for users. Maruichi Steel Tube provides a wide variety of products in response to diversified needs of customers. Steel belts of optimum quality processed at the Takuma Plant, are used at each plant of the Maruichi group. Maruichi Steel Tube's management is independent from any other group of enterprises, and not restricted by any suppliers or customers. Therefore, a business expansion in pursuit of the maximum profits is always possible. The healthy financial structure based on the policy of business operations serves as the powerful backbone of Maruichi Steel Tube. Maruichi Steel Tube develops steel tube business and its related business. Products are sold through two routes, i.e., the sales routes of general trading companies and Maruichi Kohan Ltd. Maruichi Kohan has its own warehouse, keeps in stock of products, and sell them. 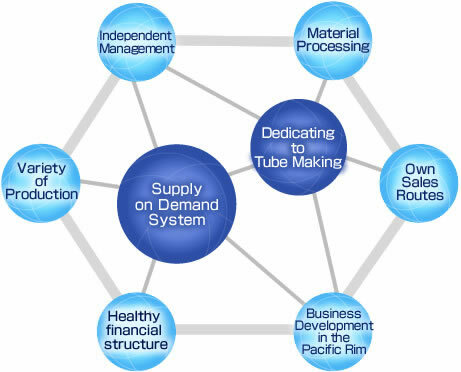 This system reflects customers' needs, demand trend, and price trend vividly in Maruichi Steel Tube thus always making it possible to draw up management strategies that are sensitive to the market. Maruichi Steel Tube's business deployment makes it easy to grasp the trend of market conditions, such as the supply and demand of hot coils and other products.